A newspaper article published in The Oviedo Outlook on September 29, 1971. The article details an English Hunter Jumper horse show scheduled for October 9. The show was hosted by Lars White and held at Tally-Ho Farms, located at 550 East Chapman Road in Oviedo, Florida. Between 50 and 60 horseback riders from Sanford, Winter Springs, and Cocoa, were expected to participate in the event. Original newspaper article: "All English Horse Show Set for Tally-Ho Farms." The Oviedo Outlook, September 29, 1971, page 5: Private Collection of Edwin White and Carolyn White . 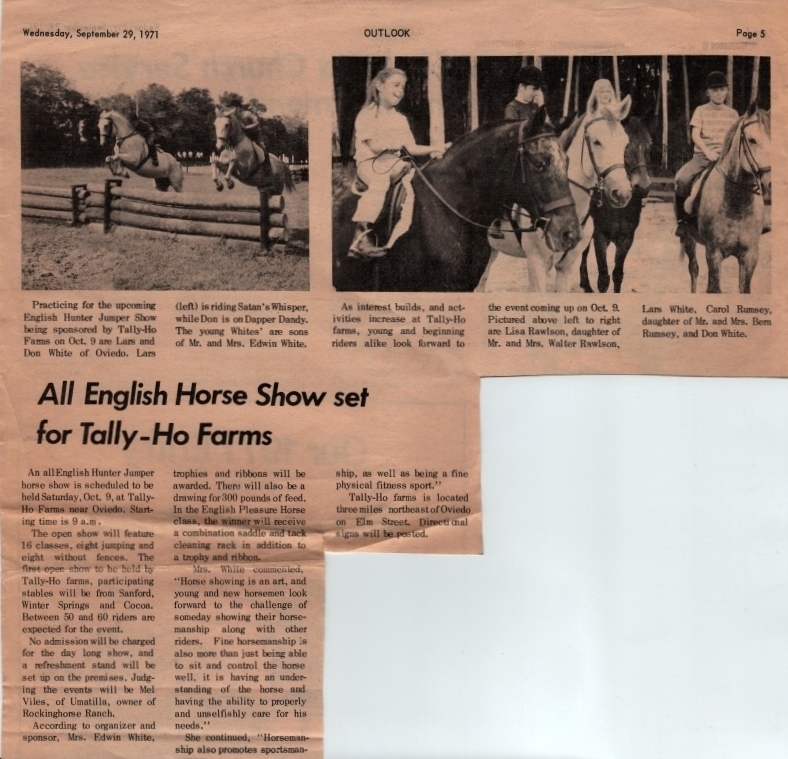 Digital reproduction of original newspaper article: "All English Horse Show Set for Tally-Ho Farms." The Oviedo Outlook, September 29, 1971, page 5. This resource is provided here by The Oviedo Outlook and is provided here by RICHES of Central Florida for educational purposes only. “All English Horse Show Set for Tally-Ho Farms.” RICHES of Central Florida accessed April 22, 2019, https://richesmi.cah.ucf.edu/omeka/items/show/6302.